3.1 5 speed. cell phone time app..
Re: 3.1 5 speed. cell phone time app.. Try using that app on a paved clean road and not a sand covered one... It will be amazing at what the results read when the sensor is actually picking up the right g-forces. Also where are you placing this phone when doing the run? It should be securely mounted to a surface that will not move during the run, such as a windshield mount or similar. Also the fact that you think you can take on a N* Caddy with your 3.1 5-speed tells me that you are just being a kid and thinking you have a little bit more than what you really do... Trust me we all went through that phase. I started out with a stock 3100 4t60e combo and thought it was great... Then I did a 3400 and was thrown back in my seat... Then I brought it to the track... 15.7.... all day long... after some more work I finally got the car to a 15.4 consistent with 3400 manifolds and down pipe and such... Then I started playing with laughing gas.... thats when I nabbed my 14.5's then a 14.2 and then my beloved 13.8 in 2006. After I got that I got the bug... I bought headers and a tuner and did a OBDII swap on my car, I also bought a 3400 and a 3500 and combined them and installed a Milzy motorsports Stage 1 Cam... Did some porting on the heads and some on the intakes and bought a rebuild kit for my trans and a different gear set and different torque converter... All said and done I got the car to do a 14.8 N/A. I never got to run the juice on that setup. All I'm trying to say is when your young you think that what you have is really fast... but to be honest you really have nothing to compare to... My 13 sec run started to feel like merging onto the highway and I got used to the feel of it, where as before when I was running 15.7's I thought I was screaming. Don't rely on those times at all... Go to a track and do not expect anything out of the high 16 sec realm or you will be greatly disappointed. Once you've done that then try the same phone app on that track and see what comes up, If it's very accurate there then as noted when testing at home make sure to find an area thats not covered in sand, otherwise your just wasting your time. Every second your car is spinning while using that app you are sending it false data and it's interpreting it wrong. well its still a pretty sweet app. lol i dont care if its off its still kinda cool, and it doesnt use gforce for the readings it runs off GPS there is a few gforce meters and stuff out there but this program connects to the gps on the phone and has to be fixed on satallites to use it, in my area it was a clear night nothing around me i was the only one on the road and it was fixed on more then 10 sats. it pin pointed the exact spot i was sitting on the road too so at least that part is accurate lol. the first couple runs were like 19's. 18's and then a 15.5 i was like wow look at that lol. The cady. i did smoke him.. weather he was hammer on it or not i cant not tell you, but i do know when i looked back as i pulled away i seen the front of his car lifting so i know he hammered on it, he stayed with me till i got in the higher rpm is when i was pulling away, i kept letting off and let him get back on my bumper and punched it again all the way to town like that he couldnt get close to me. he said oh i have a bunch of stuff in the car cuz im going away for the week and low on gas and whatever . 2 weeks later he was hard up for cash and sold the car to my dad for scrap. had some electrical problem where the spedo and dash cluster would randomly shut off and throw fits. 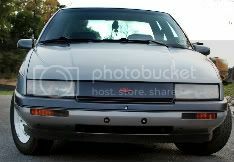 My friends stock 3100 auto 97 grand am, can not keep up with me at all, from a stand still and rolling i can pull away from him the whole time and i know he was hammering on it cuz he kept getting mad that he couldnt pass me, i drove his car lots of times, i drove it even before he did cuz he would get me to come and drive him around the first day he bought it. soon as it gets nice im gonna hit up the track there is 1 not far from me, im not doing anymore work to my n/a motor then whats already done unless it doesnt cost anything, need to save up to build the turbo engine and look into getting a different gear ratio 5 speed. you can't use a gps signal for timing like that, it will never be accurate from one point to another because it is semi predictive to give you more accurate directions. They use a triangulation method which is why it is better to be in range of at least 3 satellites, the more satellites in range the faster it will pinpoint you and based on the last polling predict where you should be. do they have an app like this for blackberry?? that sounds awesome. im sure its not 100% accurate but its still a pretty cool app. I know stock sy's throw down 1.6 to 1.8 60' times so we will see what it says for mine, I think it will be off and I can pull 11 satellites where I'm at. i was shifting before 5500 rpm in 3rd and 4th and got a slower end time. my car pulls really hard in the upper rpm's if i shift below 5500 rpm im running way slower in the end. 60' 5.5 @22.57..........................Below.. 2nd gear take off shifting past 6500-7500 range. I'm surprised that , on this technically correct board especially, no one challenged this, especially considering some of the posters to this thread. Your engine is flat NOT CAPABLE of any speed above 5500 rpm's. It surpasses the PHYSICAL turning speed capability of the motor. So telling me you're shifting in W41 Quad 4 range of 7000 rpm's tells me you're full of crap. Sorry to be blunt, but with these BS statements alone we can consider the rest of what you say to be rubbish as well. Have fun with your virtual 1/4 mile sand races. IIRC we already debunked this in another one of his threads, where we found out his tach is WAY wrong... he is running a quad cluster or something. Ah. I had not seen that thread. Thank you for linking me. I regret I sort of had to "rekindle" it a bit as I found a bit of pure BS in a story in there involving a late model Ford that I just happen to own a make and model of. Couldn't keep from posting. The app is so delayed it doesn't start showing I'm moving until I hit 2nd, my opinion is its just like the g-tech which has been proven its off, go to a track and post your numbers from that. Hes refering to the fact that a your showing a V6 thats revving in Quad4 territory, which is odd for a stock V6 thats not built for high rpms. He wasnt saying you have a Quad4. Also the cluster you have is way off. People are saying its from a quad, but thats gotta be just a base 2.0 cluster cause my original Quad cluster didnt start the redline till 6500.